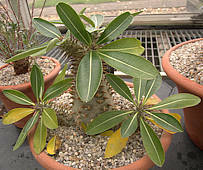 Pachypodium is a small genus of 25 species of caudiciform shrubs and trees, mostly from Madagascar with 5 species from Southern Africa. They generally grow on rocky outcrops and steep hills where micro-climatic conditions may be diffferent from the surrounding plain. Their bottle-shaped trunks and branches (if any) are strongly spined and topped by a rosette of long leaves, although a few species have compact flattened trunks. 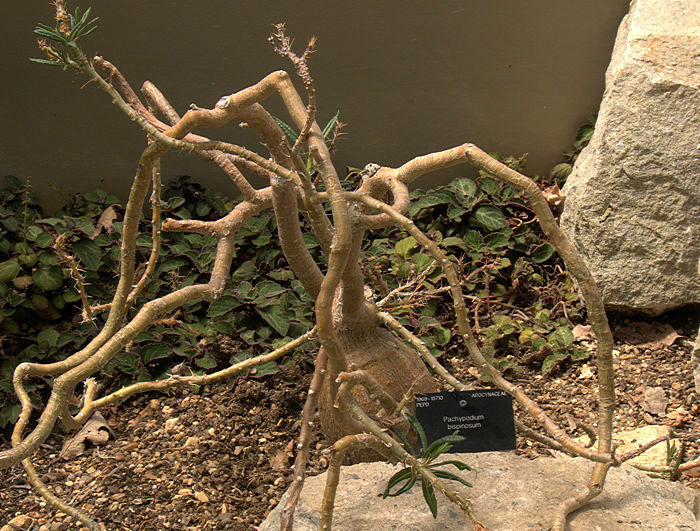 While the spines are probably a protective adaptation against herbivores, they also help the plant to survive in an arid environment by condensing water from fogs and dews, so that it drips from the tip of the spine to the base of the plant. As with other members of the Apocynaceae (Dogbane Family), the showy white, pink or yellow flowers have 5-fold symmetry. Named for: Revd. Richard Baron (1847 - 1907) British missionary & botanist in Madagascar. 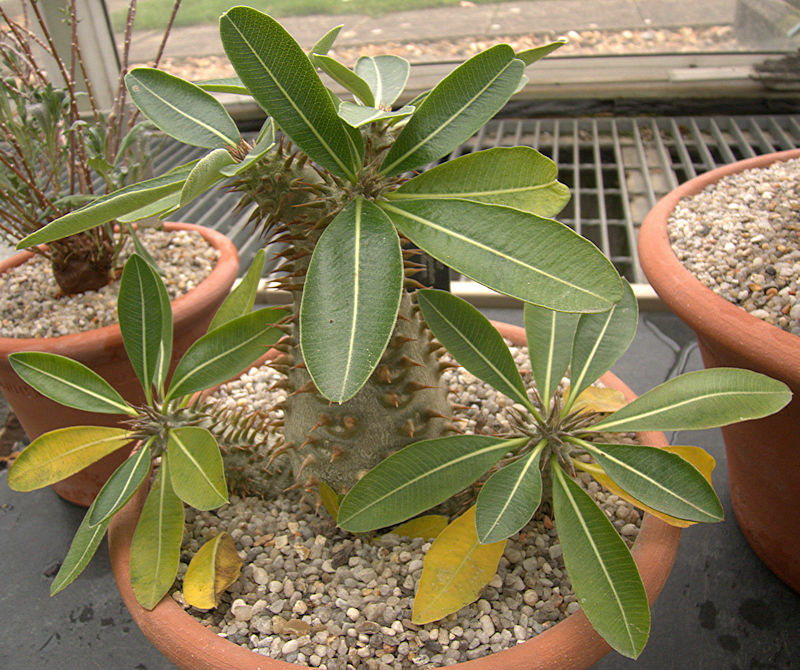 This succulent shrub typically has a spherical or bottle-shaped base to its trunk, topped with several cylindrical branches armoured with fine spines. The 5-petalled flowers are bright red. 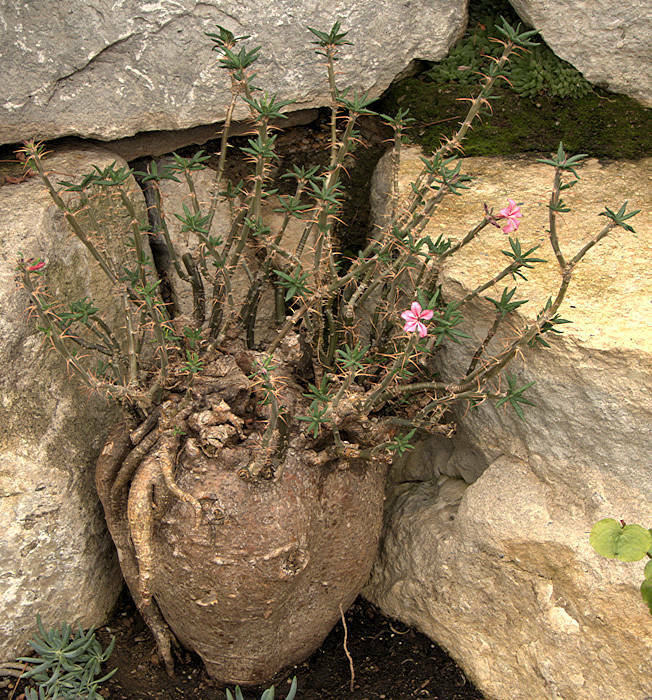 This succulent, spiny shrub has a partially subterranean caudex. 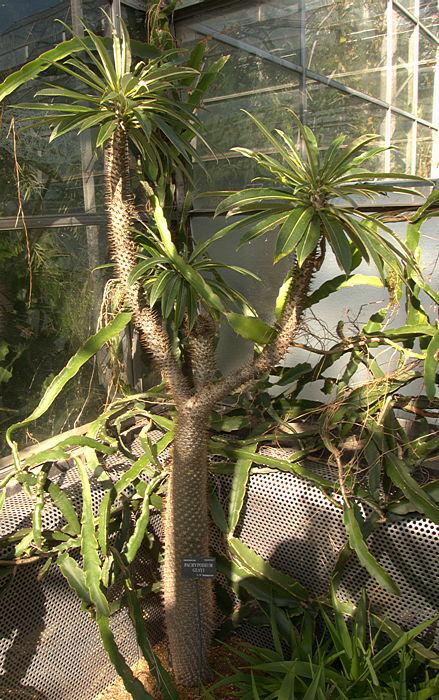 The branches are furnished with pairs of straight spines and tufts of narrow leaves along the stems. The purple-pink flowers are bell-shaped and carried at the tips of the branches. Native to the Eastern Cape, growing among rocks in dry scrub. A squat spiny shrublet. 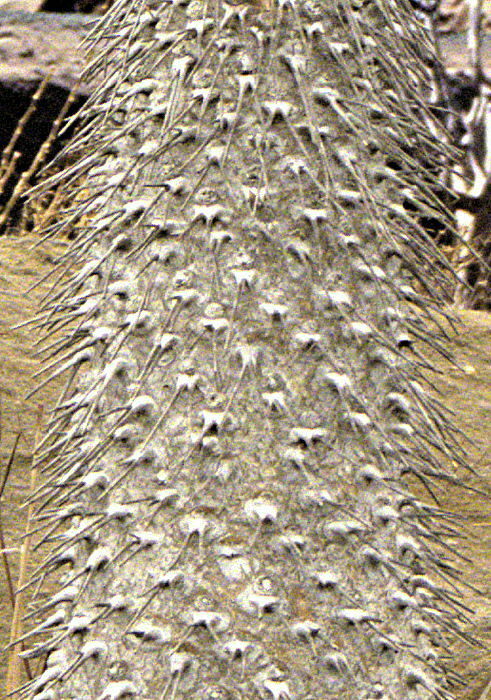 Young stems are armoured with stout spines, older stems less so. The 5-petalled flowers are bright yellow. Named for: M. Geay who discovered this species. 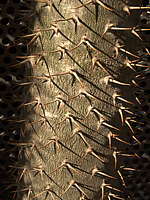 This species produces a stout, spiny trunk up to 25ft tall, branching in its upper portions. 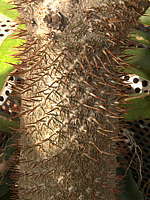 The leaves and spines are pubescent. The branching inflorescence has white flowers. 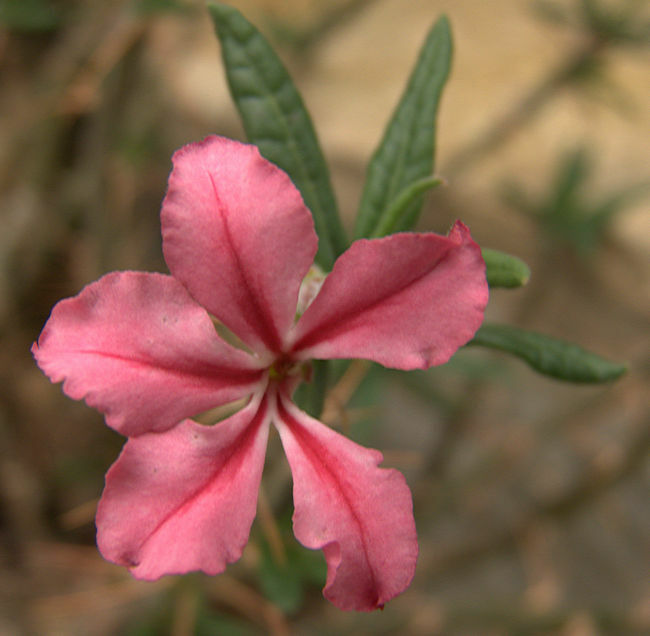 Native to Madagascar, growing at low elevations in dry forests on limestone and sandy soils. Named for: Lamère who collected the type specimen. 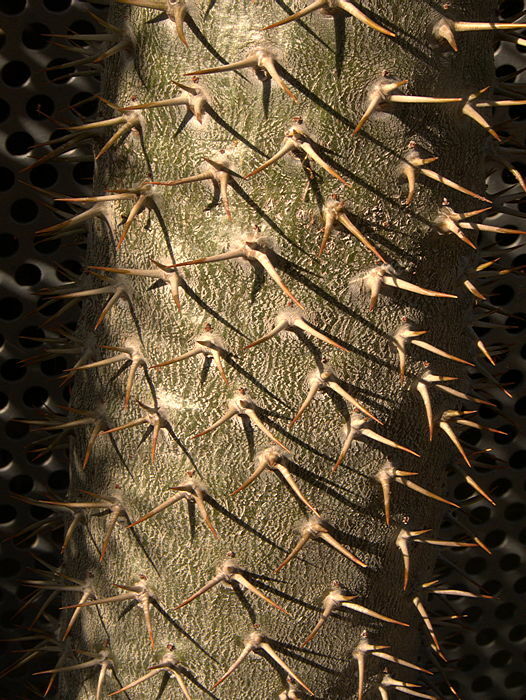 This variable species produces a stout, spiny trunk up to 25ft tall, branching in its upper portions. The spines and dark green leaves are smooth. The branching inflorescence has large white flowers. Native to Southern Madagascar, growing at modest elevations of up to 2500ft above sea level in dry forests on limy soils. 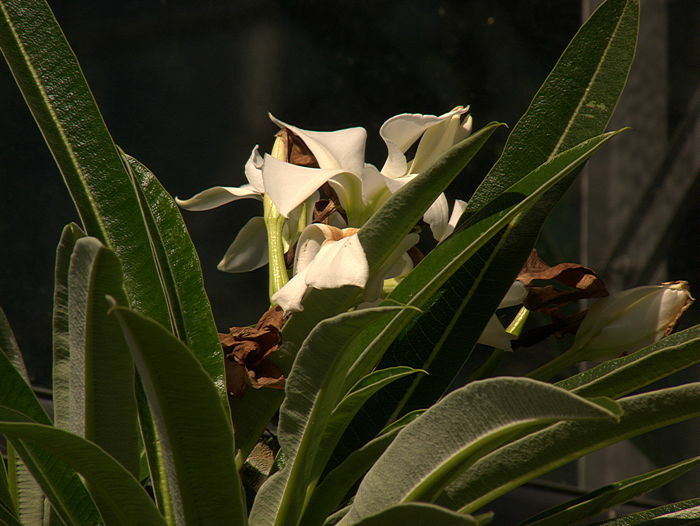 In cultivation it is quite tender and will not take any cold. A curious cristate form is in circulation among collectors of succulent plants, but very prone to a sort of slow rot. Named for: Fernando da Costa Leal, Portuguese cartographer, army officer, Governer of Huila. 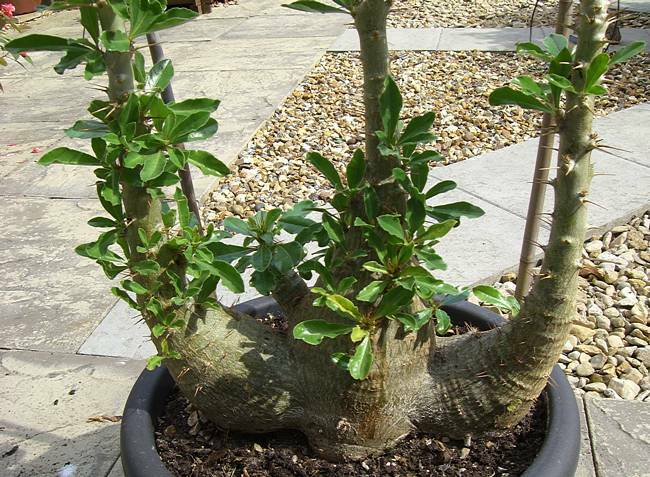 This species is a shrubby tree up to 25ft tall with a bottle-shaped trunk. The oblong leaves have a velvety covering. 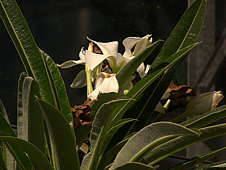 The large flowers are white, tinged with purple, and sweetly perfumed. 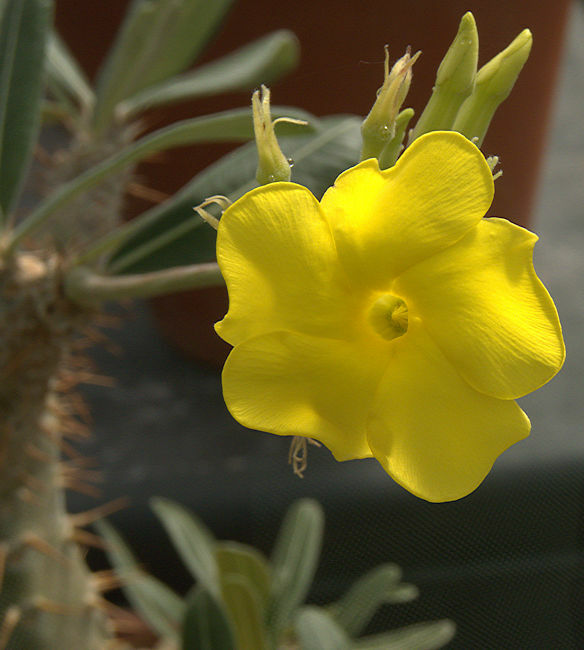 Native to Northwestern Namibia and Southwestern Angola, growing on hot, dry, rocky hillsides. 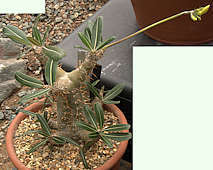 Closely related to P. saundersii but with a range separated by over 300 miles. Named for: Fernando da Costa Leal, Portuguese cartographer. Named for: Sir Charles James Renault Saunders. 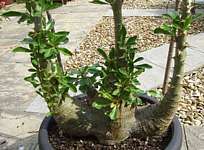 This succulent shrub has spiny, succulent stems up to 4ft tall with a swollen base up to 3ft in diameter. The dark green leaves are smooth. The white waxy flowers are tinged with purple. Native to a range from Southern Zimbabwe, Southern Mozambique to Northern Kwa ZuluNatal and Northern South Africa, growing among rocks in dry forest. 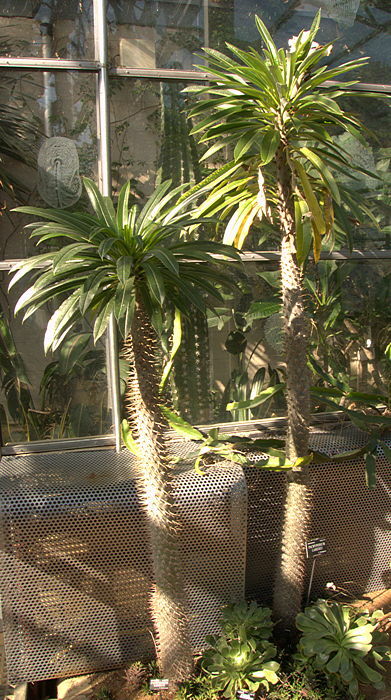 This plant has a succulent, spiny cylindrical stem up to 5ft tall, crowned with rosettes of crisped grey-green, velvety leaves. The long, tubular fowers are yellow with purple-red insides. Native to Namaqualand in the Northern Cape and Southern Namibia growing on hot, dry rocky hillsides . 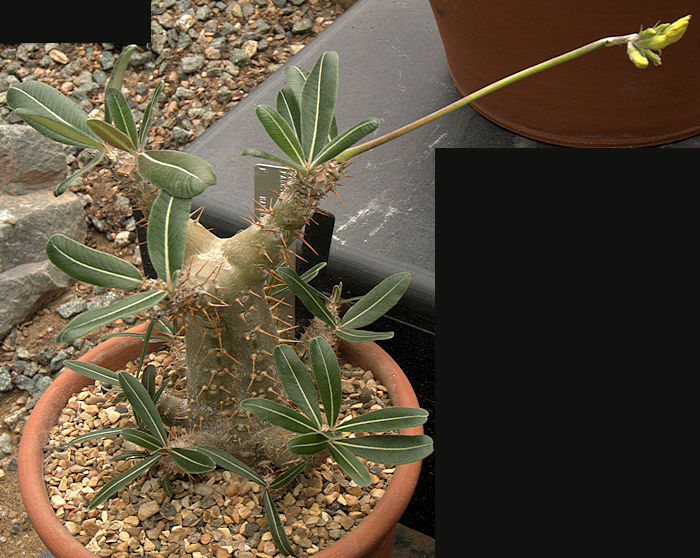 This succulent, spiny shrub has a bottle-shaped silver-coloured caudex with few spines. The small branches have tufts of narrow leaves at their ends. The yellow flowers are flat with a long tube and carried on a long petiole from the tips of the branches. 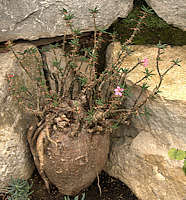 This succulent, spiny shrub has a large partially subterranean caudex. 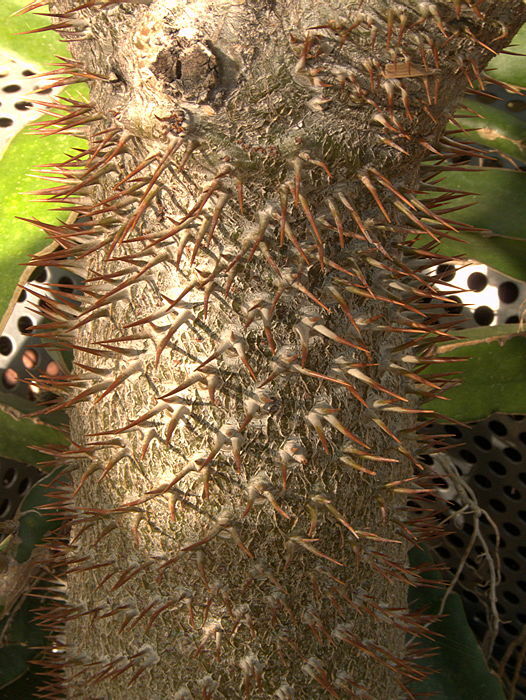 The branches are furnished with pairs of straight spines and tufts of narrow leaves along the stems. The white to crimson flowers are flat with a long tube and carried at the tips of the branches. The middle of each petal is marked with a longitudinal darker stripe. Native to the Little Karoo and Eastern Cape, growing very slowly among rocks in dry scrub. Pachypodiums will not tolerate any frost or prolonged cold and grow best in a warm sunny place. A very free-draining potting mixture should be used and even then the plants should be watered carefully. 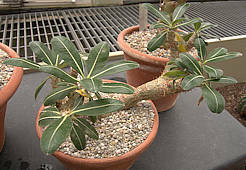 Pachypodium bispinosum tolerates a dry, cool frost-free winter at 40°C but others such as P. lamerii are liable to collapse into a heap of mush unless kept warm. P. lamerii has a peculiar cristate form which seems even more sensitive to fungal attack and collapse than its parent. 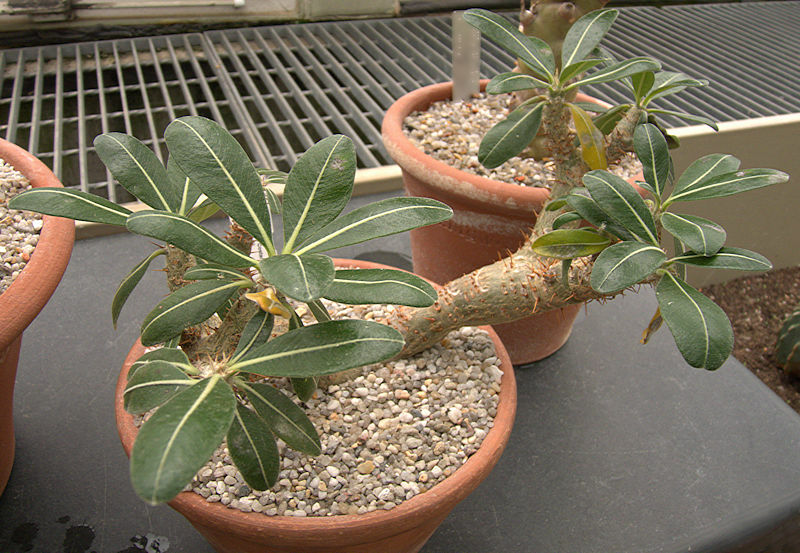 All species of Pachypodium are poisonous to humans and animals. The milky sap should be kept off the skin and hands washed after handling the plants.